Paige McPherson, second from left, shows off her gold medal. UNDATED - Sturgis native Paige McPherson captured her first-ever Grand Prix gold medal Wednesday as she took the top step on the podium for the women’s -67kg division at the third edition of the 2018 World Taekwondo Grand Prix in Taoyuan, Chinese Taipei. 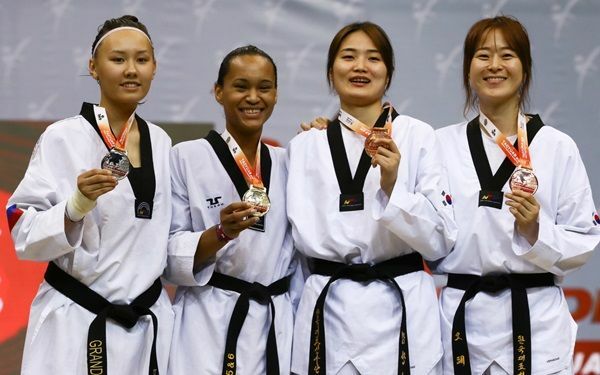 Her previous best performance at a World Taekwondo Grand Prix was a bronze medal in London in 2017. McPherson, a two-time Olympian and 2012 bronze medalist, won three matches to reach the final. She defeated Russia’s Yulia Turutina (19-5), Croatia’s Matea Jelic (7-5) and top-seeded Hyeri Oh of Korea (13-11). In the semifinal match against Oh, McPherson opened up a 6-1 lead after the opening round and increased the advantage to 11-2 after round 2, before staving off a furious third-round rally. That set up a meeting with Russia’s Polina Khan for the gold medal. In the first round, Khan scored twice to the head to open up a 6-2 lead. She held that four-point gap through the second round which ended 7-3 in favor of Khan. Trailing 7-5 in the final round, McPherson evened the score with a body kick in the final 10 seconds to tie the match and send it into the extra round. When neither fighter was able to score the golden point in overtime, McPherson was awarded the victory on superiority. McPherson was coached by fellow 2012 Olympic bronze medalist Terrence Jennings.